A deal between the 26 County Garda police and arch-loyalist Willie Frazer for a secret protest in Dublin has been revealed -- just hours after Frazer said he would not condemn an assassination attempt on the life of Six County Deputy First Minister Martin McGuinness. Earlier this week, it was reported that a plan by Loyalist lobbyist Willie Frazer for a “sarcastic” protest outside the Dublin parliament on Saturday had been postponed. But on Thursday, Frazer told a Scottish radio prankster that he had made a secret arrangement with Gardai to hold the protest, apparently to avoid a counter-demonstration. Using the pseudonym ‘Clarence Beeks’ and claiming to be a “spin doctor” for Glasgow Rangers Football Club, the host of Glasgow Radio Online managed to convince Frazer of his support for the flags campaign -- and got him to reveal that Gardai had proposed a loyalist protest in Dublin tonight (Friday night) “to surprise everyone”. “Keep it under your hat”, he tells the caller -- but a recording of the interview was later placed online. Seven years ago, an inflammatory ‘Love Ulster’ sectarian march organised by Frazer through Dublin city centre led to the capital’s worst riots in decades. The Armagh man has returned to prominence in recent weeks as a spokesperson for the loyalist campaign against the recent decision by Belfast City Council to reduce the number of days the British flag flies above the building, bringing it into line with similar civic buildings. That council vote in early December has provoked outrage among unionist hardliners and right-wing British extremists. Frazer provoked further controversy on Thursday when he claimed that 99 per cent of unionists would agree with his refusal to condemn anybody who shot Sinn Fein’s Deputy First Minister. “If someone was to shoot Martin McGuinness, I would not condemn that man, but I would not ask him to do it,” he said. Mr Frazer reportedly made the remarks while defending a comparison between loyalist paramilitary groups and the British Army and RUC. The hardline loyalist said it would be “unfortunate” if someone felt they had to shoot the Sinn Fein assembly member but claimed “99 percent of unionists would agree with him in not condemning it “if they were telling the truth”. 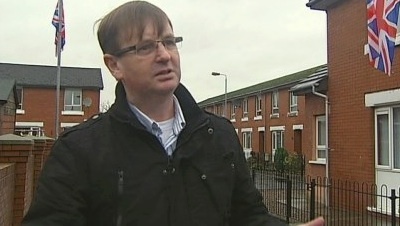 Sinn Fein last night described Mr Frazer as an “idiot”. This week has already seen some of the worst violence of the loyalist campaign. The most intense riots took place on Monday evening, following what had been a relatively peaceful protest in Belfast city centre. Some 400 loyalist protesters descended on the city hall to coincide with the first full council meeting since the decision was made to reduce the flying of the Union Jack. As in December, a section of the crowd attempted to force their way into the council chamber, but were unable to do so. About half of the loyalists then made their way to east Belfast, where they again provoked and attacked nationalists from the Short Strand enclave. They set up barricades of burning pallets and bins on the lower Newtownards Road , then tried to hijack a Lidl lorry to block the busy Albertbridge Road. The PSNI used water cannon and fired three plastic bullets in an attempt to push protesters back. Violence also broke out in Dundonald, where petrol bombs and bricks were thrown at police. Serious rioting also broke out on Tuesday evening, when loyalists threw petrol bombs, fireworks and bottles, and burning barricades were also erected. However, the violence was not on the same scale as previous nights and calmed down after an hour. There was little doubt the violence had been planned, as some riots have been openly advertised in internet posts. The unionist paramilitary UVF has been accused of organising the violence, as well as using them to recruit youths. Tuesday was the sixth night of trouble before the Union Flag was returned to Belfast City Hall on Wednesday -- to mark the birthday of ‘Duchess of Cambridge’ Kate Middleton, the wife of England’s Prince William. The brief return of the flag for one of the 17 ‘designated days’ was peaceful, but otherwise ignored by loyalists. However, it produced a demand by Ulster Unionist leader Mike Nesbitt for Middleton’s birthday to be marked by other civic buildings in Belfast as well. This (Friday) evening, the flags protestors appear to be planning a return to the widespread road blocks which marked the start of their campaign in December. Loyalists have vowed to block dozens of roads in Belfast and towns and villages across the north in an action dubbed ‘Operation Standstill’. Traffic is expected to grind to a halt from 6pm during the co-ordinated protests, timed again to coincide with the Friday evening rush-hour and with the potential to cause mayhem for commuters leaving Belfast. In addition to Belfast, protests are planned for towns including Larne, Ballynahinch, Portadown, Magherafelt and as far away as Liverpool, Glasgow -- and Dublin. Sinn Fein Dublin South West TD Sean Crowe called on Dublin people not to engage with or be provoked by loyalist protestors, who are understood to be planning a demonstration at the Dail. He warned that the demonstrations were being orchestrated by unionist paramilitaries and supported by elements of the British extreme right such as the BNP. “What we have witnessed is anti-Catholic and anti-Peace Process elements rioting on the streets, attacking property, people in the nationalist community, workers and the PSNI. This campaign of sectarian intimidation and violence must be brought to an immediate end. “Belfast is a shared city. The rights and identities of all sections of the community there must be fully protected and respected. This can only be done on the basis of equality, mutual respect and parity of esteem, as envisaged in the Good Friday Agreement. “While accepting everybody’s right to peaceful protest I would call on Mr Frazer and his associates to reconsider their plans. They should cancel this protest and all other protests which have been the cause of violence in recent weeks. “This provocative publicity stunt is designed to ratchet up tension and trouble in Dublin.